We are big My Little Pony fans in this house ever since our oldest was around the age of two or three years old. She always loved her Pony's! Over the years we have collected our share of Pony's, at one point they had a special storage bin so people wouldn't confuse our daughters room with My Little Pony land. My Little Pony has changed over the years, still keeping its light-hearted and friendly message but giving beloved characters an update. Today, our kids enjoy a whole new series of My Little Pony - a new look and cartoon. 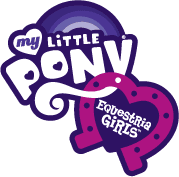 Now, they have done something even better with the Pony's, gearing them toward older girls by turning them into real girls - that still kind of look like My Little Pony. My Little Pony Equestria girls are a unique group of girls who look familiar and there's a reason why! A magic mirror was found, connecting the world of My Little Pony to Caterlot High; A place where things change, but true friendships remain magical! Through the magic mirror, My Little Pony's become Equestria Girls! Follow Sunset Shimmer, Twilight Sparkle, Rainbow Dash, Fluttershy, AppleJack, Rarity and Pinkie Pie on new adventures with My Little Pony Equestria Girls dolls! The My Little Pony Equestria girls are up for Fall Formal Princess of Canterlot High, but will it be Sunset Shimmer or Twilight Sparkle who gets the crown and rules the school? It's up to the fans to decide with this My Little Pony Equestria Girls two pack! Twilight Sparkle is ready to earn the coveted title, dressed to impress in her Fall formal outfit - paired with sleek boots and chic accessories! Sunset Shimmer is available exclusively in this set and she is looking effortlessly cool in her trendy black biker jacket over dress ensemble. Each doll comes with her own earrings, purse and brush but there is only one crown! You can find these and other My Little Pony Equestria Girls dolls from $12.99 and up at stores like Toys R Us and Walmart! Don't forget to check out the My Little Pony Equestria Girls movie available now on DVD and Blu Ray! Enjoy fun games, videos and find My Little Pony Equestria Girls dolls at the MLP Equestria Girls official website! Dolls can be found in store at Toys R Us and Walmart from $12.99 and up! Recommended age 5+ due to small parts. Disclosure: Posted on behalf of Hasbro Canada. Product is received in exchange for review. Opinions and comments on this blog are those of the author.